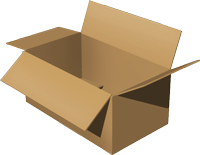 We manufacture and sell custom boxes, stock boxes & shipping supplies, including tape, bubble wrap, etc. Aside from the custom options offered on AnyBoxToday, we also inventory a vast array of stock boxes too. Our stock items include: moving boxes, mailing tubes, gift boxes, bakery boxes, cupcake boxes, comic book boxes, shipping boxes and wine shipping boxes with pulp moulded trays.